One of the essential things to think about in the offseason is how the roster for the following year will shake out. We’ve done it here at 360, both in terms of Rule 5 purposes and to see how the projected budget might shape the team. One guy who hasn’t received a lot of discussion is outfielder Mike Baxter. Our own Chris Walendin expects Baxter to keep his spot on the 40-man but, because he has options left, for him to open the season at Triple-A, essentially acting as depth for the major league roster. This seems a very likely outcome. Still, it begs the question: If Baxter is good enough for the 40-man roster, shouldn’t he, at age 27 (in December), be a serious contender for the major league roster? If not, wouldn’t his spot on the 40-man be better served going to a youngster with a chance to contribute before he’s past his prime? Let’s start by reviewing Baxter, a player many may not be familiar with since he just joined the Mets’ organization last year. As you probably know, Baxter was born in Queens and went to high school at Archbishop Molloy. He began his collegiate career at Columbia and transferred to Vanderbilt, where he was teammates with David Price. The Padres selected Baxter with a fourth-round pick in the 2005 Draft. He made slow progress through the minors, but showed good plate discipline and the ability to drive the ball. In 2010, he had a breakout at Triple-A Portland, where he posted a .301/.382/.517 line in the Pacific Coast League. Baxter made his major league debut for the Padres as a September call-up and appeared in nine games. In Spring Training with the Padres in 2011, Baxter hurt his thumb trying to make a diving catch. He eventually wound up on the 60-day DL and the Mets grabbed him off waivers when the Padres tried to sneak him through. He was underwhelming in his brief stay in the minors with the Mets, but Baxter got a promotion to the majors anyway. He accumulated 40 PA for the Mets and showed why they were interested in him in the first place. Baxter had a .206 ISO and drew 5 BB and had a HBP in his brief time in the majors. It’s clear that Baxter has value. What hurts him is that he’s not a true center fielder. His main competition for a backup outfielder spot seems to be Jason Pridie, who is capable of playing center on an everyday basis. This assumes the Mets go with five outfielders, and that Nick Evans is the fourth outfielder. 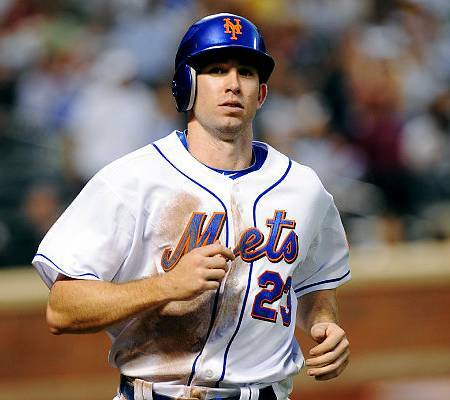 But as we’ve seen with the way the Mets have treated Evans in the past – that’s hardly an ironclad proposition. Pridie further has the advantage of being on the major league roster for most of the season, where Terry Collins and others had the chance to evaluate him up close and personal. Pridie did the job defensively and the Mets were 20-12 when he started the game in center. Baxter is likely the better hitter of the two. But while he has some power, it’s not the type you would want from a starting corner outfielder. However, as a lefty batter, Baxter could potentially form a platoon with Jason Bay, if the Mets’ expensive left fielder continues to show such huge L/R splits. If the Mets commit to Angel Pagan in center, or acquire another full-time center fielder in the offseason, that could tip the balance in Baxter’s favor. Vice President of Player Development Paul DePodesta knew Baxter from their days in San Diego and it’s likely he is one of the outfielder’s big supporters in the front office. But will that support count more than the backing of J.P. Ricciardi for Brad Emaus, who didn’t last a month in the majors with the Mets? It is far from clear what will happen the next four months. But barring a significant offseason acquisition for the outfield, Baxter seems like he will have a shot to make the roster in Spring Training. But as Emaus shows, just because you break camp with the Mets, you still have to produce or else you run the risk of not being on the roster at the end of April.